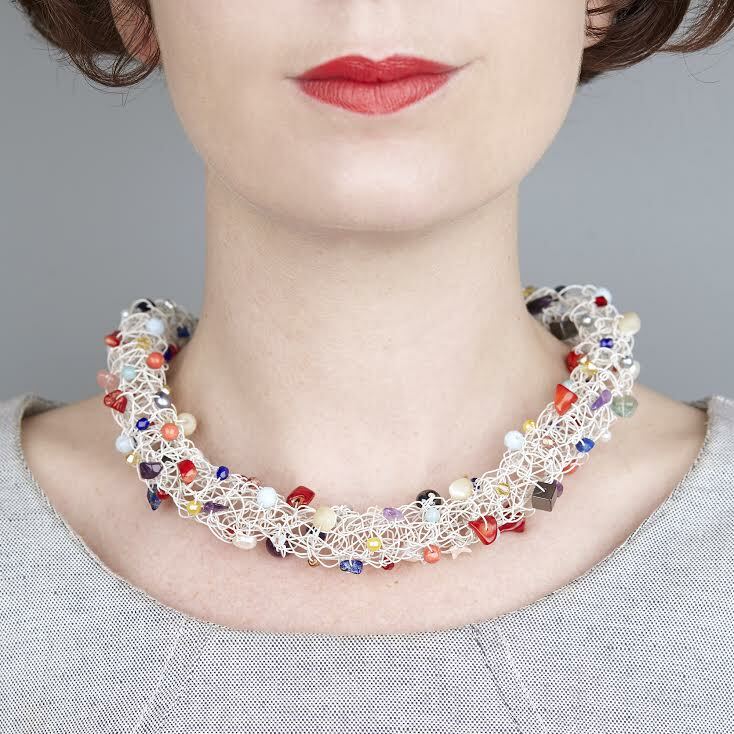 Elena Hall draws on tradition and a love of colour to inspire her unique knitted jewellery designs. At Making Uncovered she will be demonstrating some of the techniques behind her work, including bobbin knitting and crochet. 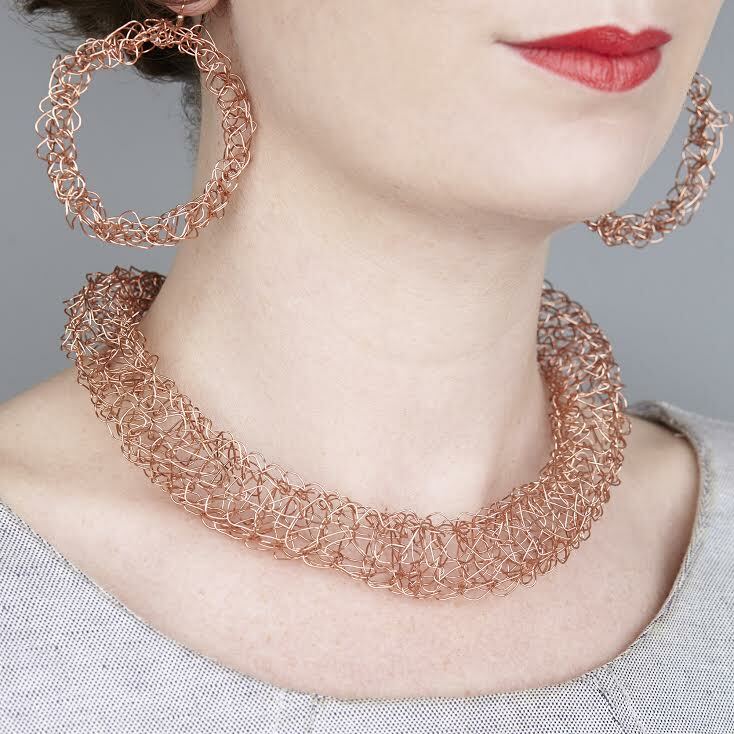 I knit and crochet modern jewellery in neon embroidery threads, copper, recycled silver and semi-precious stones. The pieces I make are inspired by traditional techniques and are delicate, structured and original. As well as my work with jewellery I also work with embroidery, and this has influenced the jewellery I make through the choice of materials – I crochet with chain and embroidery thread and knit with silver or copper and threads. I also incorporate semi-precious stones and colourful vintage beads into some of these. I live and make in Brixton and sell via my website as well as at London designer maker fairs. I also work to commission, doing bespoke pieces for special events such as weddings and also to be sold through galleries. I’ve been part of Makerhood for two years now and think it’s a fantastic network for connecting up creative people and spreading the word to the local community about how much interesting and unusual work is being produced close to where they live. Equally it gives makers the opportunity to meet interested people based locally. I visited last year’s Making Uncovered and it was completely buzzing with people and interesting makers, so when I heard Makerhood were organising another one this year I jumped at the chance to be involved. I’m really looking forward to meeting lots of local people and seeing some of the demonstrations from other makers. I’m going to be running a workshop on making a crocheted silver chain bracelet with neon embroidery thread. Throughout the day I’ll also be showing some of the other techniques I use in my work and the range of jewellery I make. 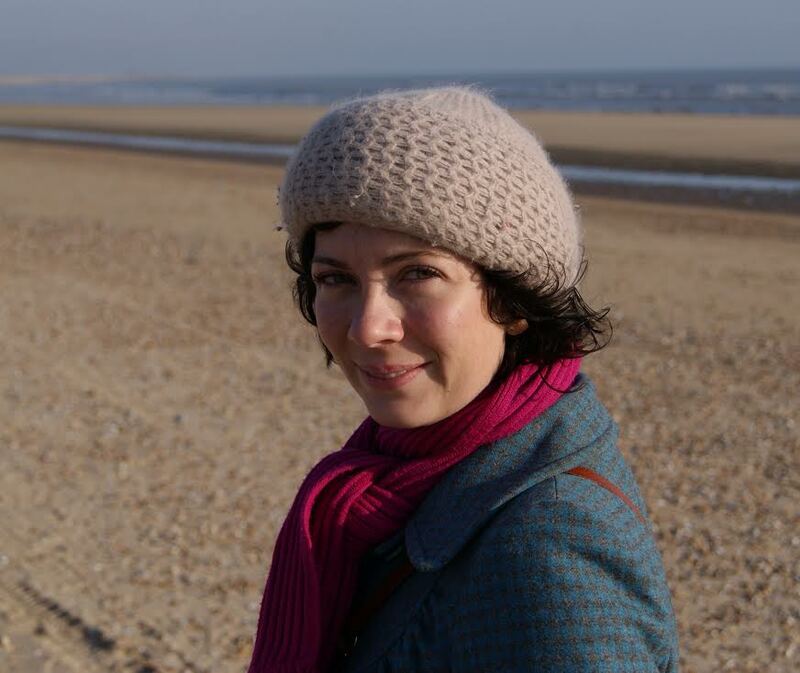 Elena’s workshop starts at 1.30pm and costs £10, including materials. Limited spaces available – book your ticket here. Previous Post Want to help a great creative event? Spare a few hours for Making Uncovered.